As the hours pass, Shari begins to sense that she wasn't suicidal at all, but in fact, was murdered. Shari then spends the remainder of the novel trying to identify her murderer with the help of her old friend Peter Nichols, whom she meets in the afterlife and is also dead. Eventually, Shari realizes who her murderer is, and justice is rightly served. 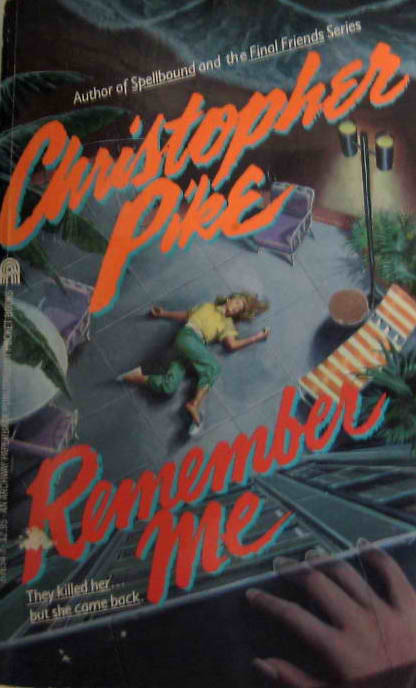 Remember Me is the first Christopher Pike novel I had ever read. From that point on, I was hooked on buying and reading all of Pike's novels that that both followed and came before Remember Me. 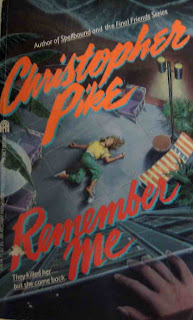 I was initially drawn to and intrigued by the cover art for Remember Me, which I included in this post for sentimental reasons, although the packaging for the book has since changed. Realizing I had stumbled upon a new genre that opened a world of magic, possibility, life after death, and horror, I began to devour every novel that existed in this genre; including those by R.L. Stine and L.J. Smith. I was 9 years old at the time. Remember Me is extremely touching; melodramatic and sad, but in the most tasteful, classy manner. Intelligently written, Remember Me will invoke in every reader feelings of love, sorrow, and appreciation for your friends and family. It encompasses every thought and feeling you could possibly have regarding what takes place after you die. Although Remember Me was written over 20 years ago, its cadence and style is absolutely classic. With the new packaging and cover art, readers may never guess it had been written so long ago if they hadn't checked the copyright date. Christopher Pike is the perfect author to read if you need a breezy, yet horrifying Halloween read. My other favorite novels by Christopher Pike are Chain Letter (1986), Scavenger Hunt (1989), and Witch (1990). Aaah, Christopher Pike! I remember reading his work when I was much younger and enjoying the light suspense and thrill of it all. However, I no longer have any of his books as I gave away all of them on Bookcrossing to some people in Canada and they loved them. One of my dear favourites was 'Witch' and 'The Trilogy' - 'The Party', 'The Dance' and 'The Graduation'... all three of those books were great books and I read them a few times before sending them and 'Witch' to Canada. I know! I regret getting rid of all my Christopher Pike books years ago. I'm glad I kept my original Vampire Diaries and Secret Circle books by L.J. Smith, though. I had no idea they would become so popular over 20 years later!! My mum has got me hooked! The remember me books are some of my faves but i cant belive they changed the cover!?! the old one was much better.